Home » non profit » NatureTrack’s new website! I am very excited to announce the new website for NatureTrack. Kids puzzling the mysteries of nature; that’s their story and they make it happen over 2000 times a year. They transport students outside, successfully engage their enthusiasm to focus on wild things like bird songs, animal tracks, and bones. They load their brains with nature, relating field science to school standards. The children return to their teacher more curious and better grounded to ask the intelligent questions and make better decisions tomorrow about our planet. 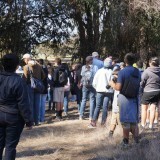 FREE NatureTrack field trips fill the school budget gap with ingenuity and wonder! NatureTrack even cover the costs of getting there. The mission of the NatureTrack Foundation is to instill students with the leadership skills, attitudes, and habits for lifelong learning and inspire them to be respectful stewards of our natural world.